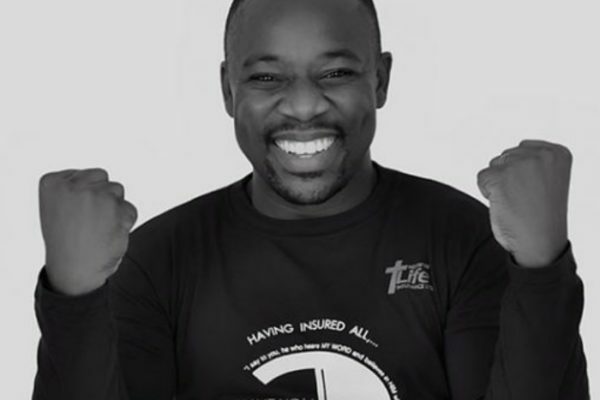 Nii Okai will host his annual dubbed ‘Hymns Unlimited Concert’ at the Mount Olivet Methodist Church at Dansoman in Accra. The event will feature other prominent gospel musicians like Eugene Zuta, Pastor Helen Yawson, TVO Lamptey, Olivet Voices, Overflow Incorporated, LIC Choir, Winneba Youth Choir and the Harbour City Mass Choir. ‘Hymns Unlimited’, which is held annually to commemorate the Easter celebrations, will treat the audience to soothing and uplifting hymns of praise and worship to God, both age-long ones and those produced locally by Ghanaian composers, including Nii Okai himself. Nii Okai stated that the purpose of the concert is to revive the tradition of hymns and also get young people to appreciate the value and power of hymns as a form of worship and praise to God. He said there is the need for churches to strongly hold on to hymns as a key part of their services. Nii Okai extolled TVO Lamptey and other composers in the country, adding that the presence of God will be felt at the upcoming event. The theme for this year’s event is ‘Hymns of Everlasting Praise’. Proceeds from the concert will be used to support Nii Okai’s Saving Hearts Foundation, which is a non-profit organisation established to raise funds to support Ghanaians who need heart surgeries. The event is being held in partnership with the Strategic Communications Africa Limited (Stratcomm Africa). The nominations for the 2018 Vodafone Ghana Music Awards (VGMAs) were released on Sunday with lots of talking points across social media. Sarkodie topped the list of nominations garnering 11 nods for his individual works as well as collaborations with the likes of Fancy Gadem. 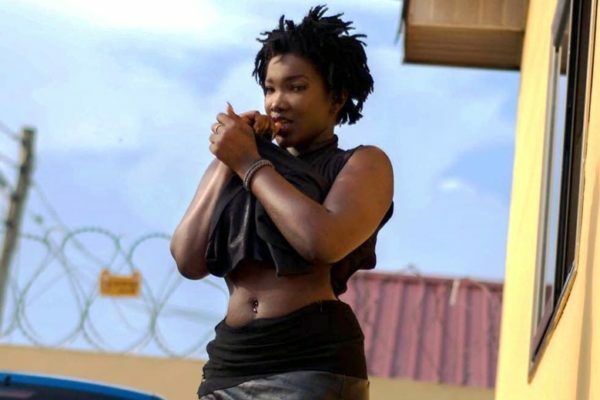 Last years Artist of the Year, Joe Mettle followed with 8 nominations, while Ghana’s new darling girl Ebony received 7 nods posthumously for her works. 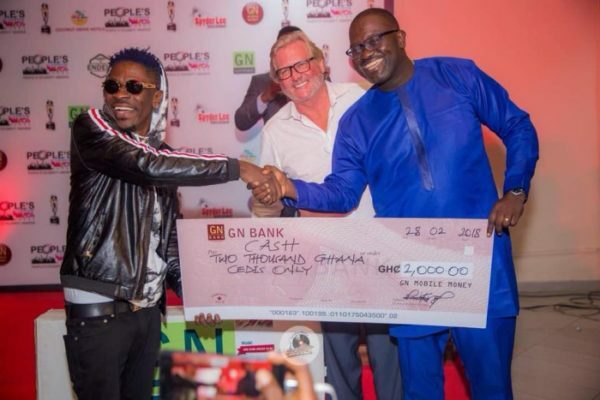 The Ghana Music Awards festival will witness a nominees’ jam in Cape Coast on March 24, a music seminar at the Movënpick Hotel on April 12, and the main event at the Accra International Conference Centre on April 14. The celebration jam is however slated for April 28 in Tema. 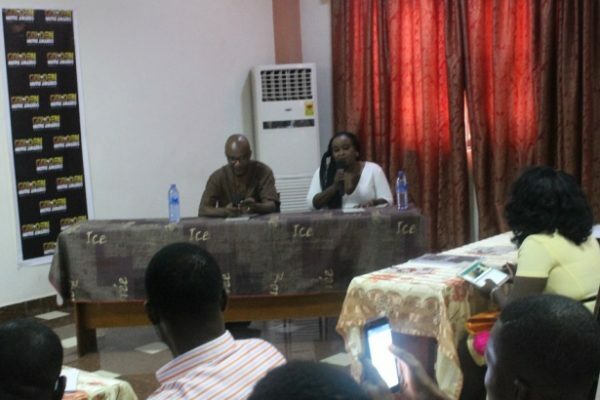 Officials of the Golden Movie Awards Africa event paid a visit to Kumasi to interact with stakeholders in the industry. The session was held at Ceeta Kel Hotel in Asokwa and attracted movie practitioners and media personnel from the metropolis. The officials from Ghana Movie Awards Africa were Mrs. Mimi Andani Michaels, Director for Golden Movie Awards Africa and Mr. Ken Addy, Media Director. The director spoke about the need to change the negative narrative of Africa through films and why it was crucial for film makers in Ghana and particularly a film hub such as Kumasi to come up with compelling stories to match their compatriots on the African continent. 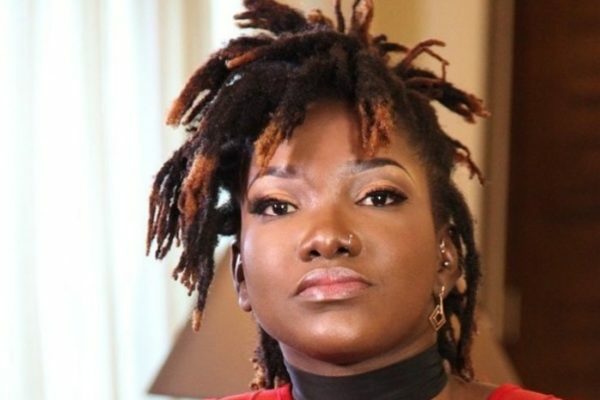 She debunked the unsubstantiated allegations that the Golden Movie Awards Africa was only interested in movies in the English language and pointed to the fact that one of their own ,Mr. Kenneth Yeboah, producer for Made in Agege had sixteen nominations and three awards in the maiden edition. On his part Mr. Ken Addy took the stakeholders through the calendar of the awards and explained the procedure for submission of films which he said was opened on the 1st of February 2018 and ends on the 1st of April 2018. He informed the gathering that the jury for this year’s edition will include members from Kenya, Nigeria and Cameroon and that the Nominations announcement will take place in Cote D’Ivoire on 3rd May 2018. The main event is slated for 2nd June 2018 in Accra Ghana. There was a question and answer segment to address the issues the stakeholders had. The rest are Favourite Actor, Francis Andoh; Favourite Comedian, Lexi Da Comic; Favourite Female Radio Presenter, Ewurama Attoh; Favaourite Journalist, Attractive Mustapha. Christian Agyei Frimpong wins the prize for Favourite Male Radio Presenter; the Favourite Male Sports Personality was won by Asamoah Gyan with Priscilla Adubea winning the Favourite Female Sports Personality Award. 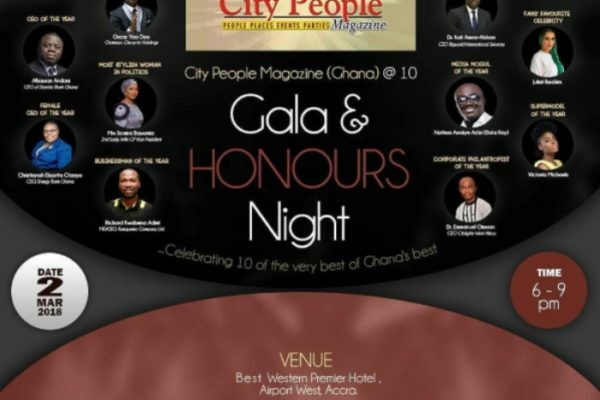 City People Magazine is set to honour 10 influential, Chief Executive Officers(CEOs) in Ghana at a gala night in Accra. ‘City People (Ghana) @ 10 Gala & Honours’ is a relaxingly-corporate VIP event billed to hold on Friday, March 2, 2018 at Best Western Premier, Airport West, (Vine Lounge) Accra between 6:00-9:00pm. The event is strictly by invitation only. The event, being packaged by Blue Synergy Media (operators of the City People franchise in Ghana), is being put together to mark a decade of the operations of Nigeria’s oldest and biggest weekly celebrity magazine in Ghana. In February 2008, City People, Nigeria’s biggest magazine in the last three decades was officially commenced operations in Ghana in 2008. It had its official launch at the La Palm Royal Beach Hotel in Accra. Senator Musiliu Obanikoro and Hon. Haruna Idrissou (Ghana MP & former Communications Minister) officially launched the operations of City People in Ghana at that grand event which had performances from top Nigerian and Ghanaian artistes. Ten years after, City People has become not almost a household name in Ghana, but also become the biggest platform that has created opportunities for the country’s entertainment players in Nigeria. The annual City People Entertainment Awards has celebrated virtually all of Ghana’s big and rising entertainment. It has also created a lot of activities on the corporate and social scenes. In celebrating its 10th anniversary, a classy re-launch party, where 10 deserving Ghanaians who have done well in different sectors in the last 10 years will be honoured. Public nominations came from all across Ghana, reflecting a nationwide interest in the Awards. This nationwide participation can also be attributed in part to the Regional Tours across Kumasi, Tamale and Bolgatanga by the organisers. Public Nomination entries were received after the public was asked to nominate their best makeup artists, brands and retailers for various categories ahead of the Awards in April. The Ghana Makeup Awards Board is currently undertaking a process to identify and shortlist unique nominees from the 2400 public nomination entries. Shortlisted Nominees will submit their Official Awards Nominations to satisfy all requirements and prove their eligibility in various categories. Four Finalists per category will then be announced to compete formally in the 2nd Ghana Makeup Awards. The 2nd Ghana Makeup Awards will be held on April 28 at the prestigious Kempinski Gold Coast City Hotel in Accra. The Awards are being held as part of a week-long celebration dubbed Makeup & Beauty Week, which among other objectives seeks to highlight the economic impact of the Ghanaian and African Makeup and Beauty industries. The Makeup & Beauty Week is to celebrate, reward and promote stakeholders in the makeup and beauty industry in Ghana. They includes artists, brands, retailers, wholesalers, consumers, industry advocates and public-sector partners of the makeup and beauty industry in Ghana. 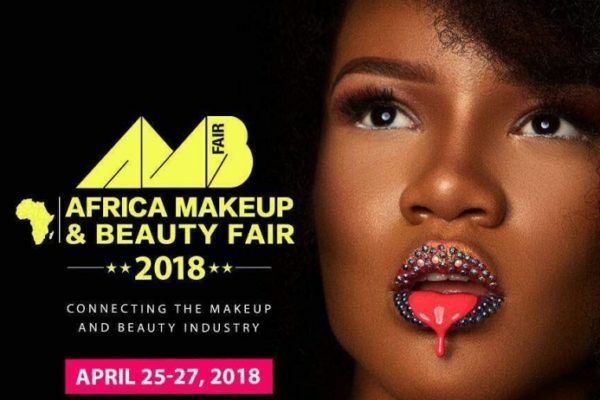 The Makeup & Beauty Week also includes the Africa Makeup & Beauty Fair (AMB Fair) to showcase and connect the Ghanaian makeup and beauty industry to African and global consumers, vendors, partners and service providers. AMB Fair includes exhibitions, workshops & seminars, training, makeup runway shows and live demos. Exhibitors are also expected from Nigeria and other parts of the continent. The 2018 Makeup & Beauty Week is being organised by Makeup Ghana with the support of the Ministry of Tourism, Arts and Culture. 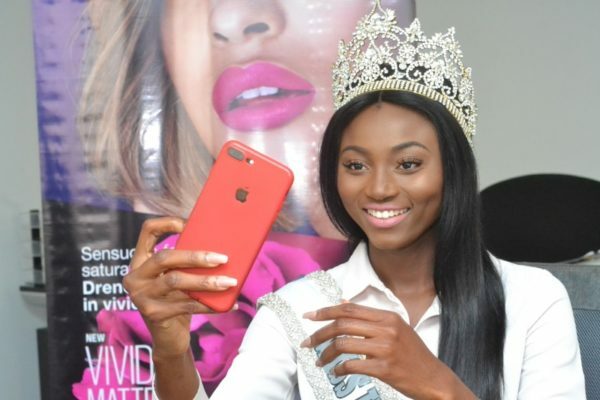 Newly crowned Miss Universe Ghana 2017 queen Ruth Quashie has already hit the road running after winning the enviable crown. 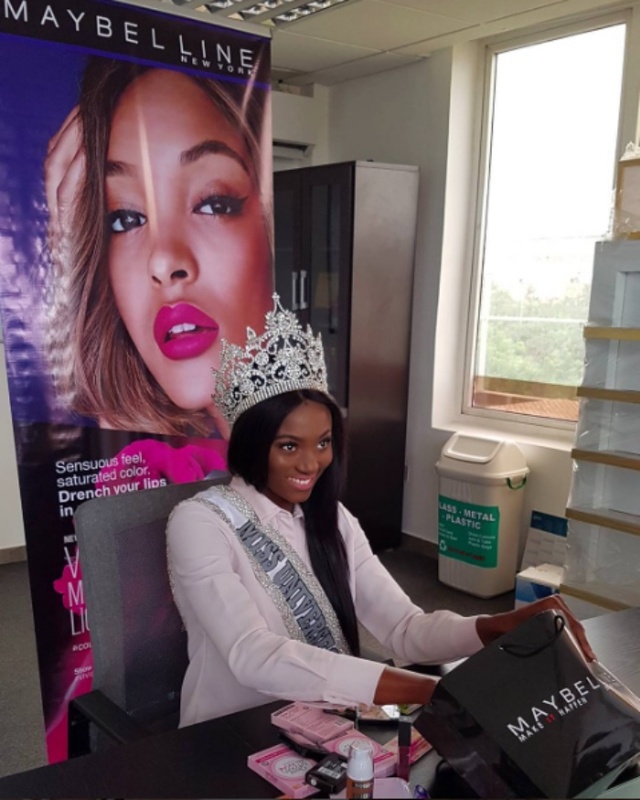 Ms. Quashie and her team have visited the office of Maybelline on the Spintex Road in Accra to show her appreciation to the international make-up brand for supporting her and the pageant. Brand Manager for Maybelline New York in Ghana, Aretha Yorke Sabeng and her team warmly welcomed the queen and her team and congratulated her for being the chosen queen among the lots and also encouraged the reigning queen to shine on the international stage and bring the Miss Universe crown to Ghana. Maybelline, which is the queen’s official makeup company, presented a complete makeup package to the queen as part of her prize package for winning the crown. Maybelline New York in Ghana will provide one-year supply of makeup products for the Miss Universe 2017 queen and also support her and ensure that she glows on stage at Miss Universe International in America come November. Maybelline provides scientifically advanced formulas, revolutionary textures and up-to-the-minute trendsetting shades effortlessly, affordably and beautifully. Ruth Quashie thanked Maybelline for their support and promised to make Ghana proud. “Thank you very much Maybelline for these amazing products. I am going to slay at Miss Universe and make Ghana proud. Thank you”. Ruth Quashie, a 23-year-old Business Administration graduate who hails from the Central Region beat 120 young women from across Ghana with her ‘confidence, attentiveness and beauty to win the coveted title on Saturday September 2, 2017 at Labadi Beach Hotel in Accra, Ghana. Beautiful and eloquent Ruth Quashie is preparing to face the rest of the world and represent at Miss Universe 2017 pageant to be held on November 26, 2017 at The AXIS, Las Vegas, Nevada, United States. The Miss Universe Ghana event is organized by MALZ Promotions, under the directorship of Miss Universe Ghana National Director, Mrs. Menaye Donkor Muntari, who is a former queen of the pageant. The recognition for Miss Ghana 2017, the anniversary queen and the event organizers, Exclusive Events Gh. Ltd, as well as other stakeholders involved in the Miss Ghana brand – shot up a notch after the President of Ghana paid homage to the brand. 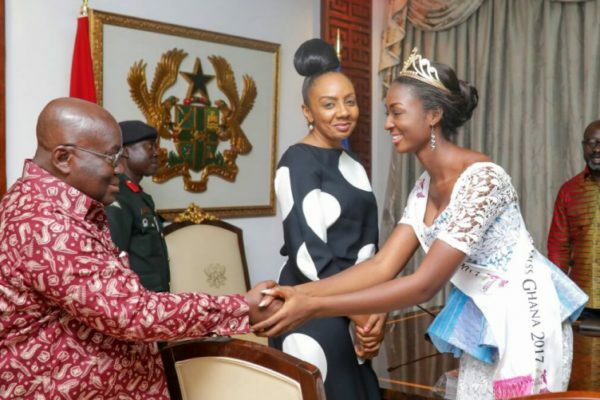 The President, Nana Akufo-Addo had a special meeting with Margaret Dery, Miss Ghana 2017, together with her runners-up, Priscilla Gameli and Marigold Frimpong, in the company of the Executives of Exclusive Events Gh. Ltd – led by Ms. Inna Patty. During the grand finale held over the week, The President, who was in the Northern part of the country on an official tour, sent a goodwill message to the pageant via video footage which was shown to the audience – and in his remark, he promised setting up a meeting with the Queens upon his return to the Flagstaff House. 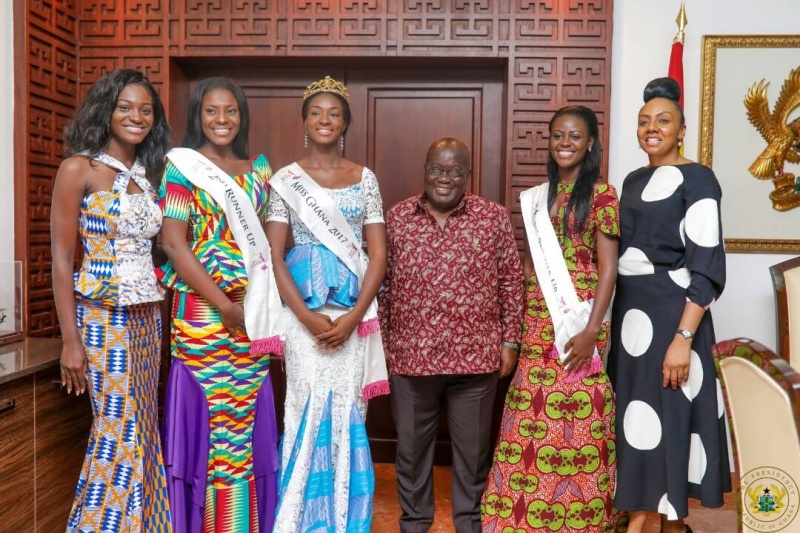 The President congratulated the organizers for a successful organization of the MissGhana60YearsOn event and extolled the brand for its projection of women empowerment. He asserted that, the Office of President would continue to support the Miss Ghana pageant and all related projects that are aimed at uplifting the Ghanaian. Miss Ghana 2017/MissGhana60YearsOn was powered by Exclusive Event Gh. Ltd in collaboration with Ministry of Tourism, Arts & Culture and Ghana60YearsOn Planning Committee. The rest are; Asantewaa Premiere Guesthouse, Best Western Atlantic Hotel, Oak Plaza Hotel, Takoradi, Skyplus Hotel Ho, Samrit Hotel, Tyco Hotel, Royal Cozy Hotel, Busua Beach Resort, Eusbet Hotel, Grand Casamora, Raybow Hotel, Lizzy’s Sports Complex, Magnum Force Securities, Mirage Hotel, Tomreik Hotel, La Chaumiere restaurant, Buka Restaurant, Koko King, La Galette, PadThai Restaurant, Regal Chinese Restaurant, Bush Canteen, Gold Coast Restaurant, Jamrock restaurant, Flair catering and Pink Panda.